Opening Reception: May 18, 6:30 - 8pm. Susan Corner turned the family room of her home into a studio space 14 years ago. The walls and storage areas of her studio overflow with two decades of creative endeavour. South facing windows and a “sun-hole” in the ceiling deliver natural light. The artist is much inspired by the sea and West Coast flora and fauna. Woods at Yellow Point (above left) recalls an annual February get-away to the popular rustic retreat. At that time of year the old growth forest is damp and fragrant with winter rains. Springy moss is underfoot and lichen clings to the towering trees. Various techniques bring to life the sensual pleasures of a forest walk. Rich reds, greens and golds enliven repeated motifs; drips and splashes add textural interest. A golden background light shimmers through the vertical tree trunks. For Susan, the bright colours and energetic shapes in Girl with Bike (above right) convey the joyful freedom of childhood adventures. 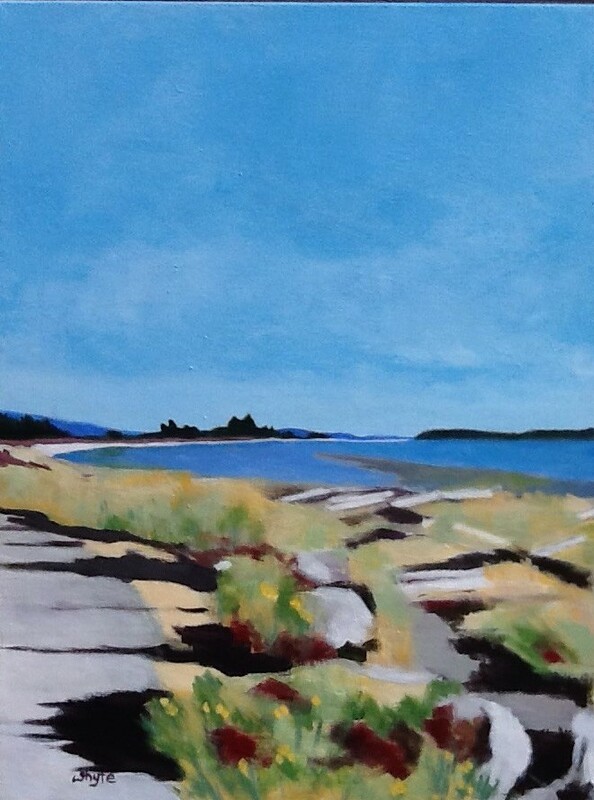 It was painted at the Metchosin International School of the Arts (MISSA) in 2015. Called Mixed Media Mayhem, instructor Jean Pederson encouraged participants to make marks using a variety of methods. Using stencils, dripping, spraying, glazing, textural mediums and gels, opened up new horizons for the artist.“MISSA was a great experience for me,” she recalls. A trip to Cuba in 2015 spawned Malecon Dreams (above left). The Malecon district of Havana is an ocean front boulevard lined with historic buildings, many in disrepair. The painting recalls a photograph taken of a woman at her balcony window in the area. The atmospheric artwork drifts between the tumble down decay of urban Havana and a dream like remembrance of happier heydays. Raked patterns on the painted surface add a tumble-down texture of wear and tear. Warm blues and sepia tones emanate summer warmth and sandy beaches. My Tears are Floating on the Wind (above right) followed a series of personal losses in the artist’s life. On a sad anniversary, Susan went for a walk on a blustery day. While seated on a bench, she sensed the buffeting wind moving through her wall of grief. “I felt the tears being wiped from my face,” she recalls, “and floating away on the rushing wind.” This experience brought a sense of relief and return to life - a letting go of grief. To convey this breakthrough, the artist painted dynamic bands of ascending colour combined with lots of airborne material. 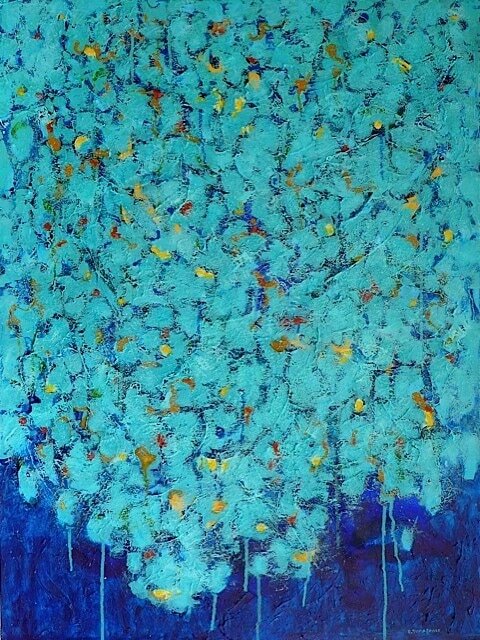 Drips, splashes and loose splotches of colour add a joyous windswept chaos to the composition. ​Artists in attendance at the Arts Centre opening May 18. Judy Kujundzic, Soul Passage, acrylic on archival paper, 18x24 in, 2017. Kate previewed arts events for 18 years at Boulevard magazine.